Simply follow the 10 Minute Method twice per day. After the 10 minutes, you can take off the belt. This starts the fat reducing process that lasts for several hours. You can use the Tummy Tuck® System in 3 ways. The 10 Minute Method ignites a fat burning chain reaction that sets off a domino effect gradually reducing fat away from your belly long after you've taken off the belt. It works even without changing your lifestyle even if you wear the belt just for your 10 minute sessions. Play the video below to see the fat burning chain reaction. You get to choose how to use it! No need to wear the belt while exercising. Simply do the 10 Minute Method in the morning, then exercise anytime during the day. You'll look slimmer instantly when you put on the Tummy Tuck Belt. 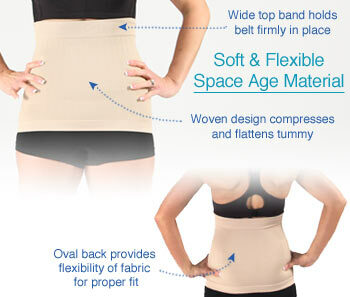 Made with soft, flexible space age material, the Tummy Tuck Belt provides comfortable compression that pulls your midsection inward. Wear it under your clothes for an instant slimming look, plus it's comfortable to wear all day long. 1. Apply the Thermal Accelerator cream to your tummy. 2. Put on the Tummy Tuck Belt and do 2 minutes of standing abdominal Tummy Tighteners to start the fat burning. 3. Relax or do other activities for 8 minutes. You're done! You can now take off the belt and the fat slimming will continue for several hours. effect gradually reducing fat away from your belly long after you've taken off the belt. The Tummy Tuck slims your belly without changing your lifestyle. Tummy Tuck method and day by day you'll gradually slim away the fat from your belly. starts the fat burning chain reaction, there's no need to wear the belt during your exercise. Results vary. 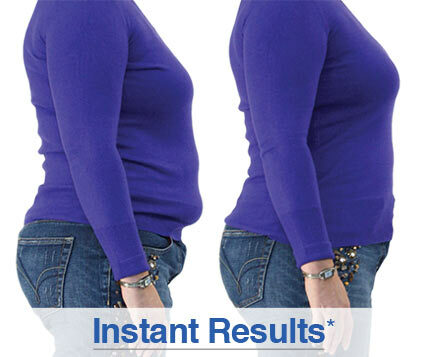 Tummy Tuck Belt provides instant slimming look and fat loss begins during first week. Typical results are approx. 0.35" first week and 1" in 30 days without lifestyle change. Average results when combined with exercise are approximately 2 times more tummy fat loss vs same exercise/diet alone. Tummy Tuck System targets your belly without added exercise and diet, not other body areas or weight loss. To target other body areas and/or lose significant weight then exercise and diet is needed. Clinical scenes recreated by volunteers that were not paid for their time. The Tummy Tuck is not like other slimming garments that simply hide the fat... the unique Tummy Tuck 10 Minute Method ignites a fat burning chain reaction, like flipping a switch that sets off a domino effect slimming fat away from your belly long after you've taken off the belt. Comes in three sizes to accommodate a variety of different belly sizes. The Tummy Tuck instructional video walks you step-by-step on how to use the Tummy Tuck system, including the follow along 2 minute standing abdominal Tummy Tightener exercises. Plus, you'll receive the Tummy Tuck Quick Start "You Choose How To Use It" guide. So you can choose: Do you want instant slimming, keep your lifestyle with no added exercise, or combine the Tummy Tuck with your current exercise program for results approx. 2 times greater than exercise alone? Simply apply this specially formulated cream to your midsection at the start of each 10 minute Tummy Tuck session. Plus, as an added bonus, we'll upgrade you to our convenient Tummy Tuck continuity program so you can continue to slim away the fat from your belly. Our 30-day money back guarantee lets you try the Tummy Tuck Slimming System risk free. Customers can evaluate their purchases for up to 30 days. If you are not completely satisfied, we'll refund 50% of your purchase price. No questions asked! The Tummy Tuck works together as a complete system to create a fat burning chain reaction around your midsection. The three part system includes the Tummy Tuck Belt, the thermal Accelerator cream, and the 2 minute tummy tightened exercises. You wear the belt twice a day for as little as 10 minutes! Simply apply the Thermal Accelerator cream to your belly, put on the Tummy Tuck Belt and do 2 minutes of standing abdominal contractions to activate the thermal fat burning effect. Then you simply wear the belt for 8 more minutes, while you relax or do other activities. At the end of the 10 minutes, you can take the belt off, and the fat melting chain reaction has been triggered and continues for several hours while you just go about your day. What does the cream do? The cream is one component of the three party system. To slim fat from your tummy, the Tummy Tuck works together as a complete system to create a fat burning chain reaction around your midsection. You'll need to use all three parts of the system and simply follow the 10 minute Tummy Tuck method twice a day. The Tummy Tuck is a complete system and you will only get results if you use all three parts of the system. I am a woman of 55 years old with the mind set that i can not achieve flat tummy but to my amazement of tummy tuck bought from shop50 Africa,my tummy now looks great. Recommended for mothers who want flat tummy. I bought tummy tuck for my POT belly, the result was amazing.. I got mine in less than 5 days! And IT WORKS!!! I don’t even hold in my stomach as much as they tell you to! AND I haven’t changed my diet or exercise plan any either! Just worked as the name implies....Thumps Up guys. This product works great, its an exception among other product i have bought.. Call us now: Whatsapp 08112966612 for Sales Service.